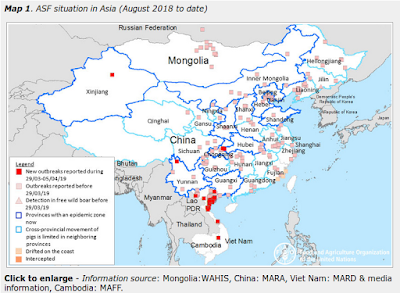 We are starting to get our monthly roll out of belated H7N9 epidemiological reports from China's provinces along with some current announcements, and over the past 24 hours FluTracker's H7N9 Tracking list has added 9 cases. There are other reports, some that will need further verification, that will drive the count higher. We will hopefully get more details from the next WHO report. Meanwhile, Shanghai is reporting a new case today, apparently imported from neighboring Anhui province. Shanghai Health and Family Planning Commission briefing March 11 in Shanghai found that H7N9 virus confirmed case on visits to Shanghai, Anhui input of human infection. Patients Sohn, M, 79 years old, Anhui domicile. Confirmed on March 11, it is now in active treatment. Within a few minutes of posting this blog, Sharon Sanders of FluTrackers posted the following summary report from the HFPC announcing 27 H7N9 casea and 15 deaths for the month of February. February 2016 (at 0:00 on February 1st, 2016 to February 29 24), the country (excluding Hong Kong, Macao and Taiwan, the same below) reported a total of 410,487 cases of legal infectious diseases, died 1076 people. Wherein, the CPI infectious plague, cholera incidence and deaths have been reported. B infectious diseases infectious atypical pneumonia, polio and diphtheria morbidity, mortality reports, the remaining 23 infectious diseases were reported incidence of 241,281 cases, 1049 people died. Before the reported incidence of the top five diseases were viral hepatitis, tuberculosis, syphilis, gonorrhea, and bacillary and amoebic dysentery, accounting for 95% of the total reported cases of class B infectious diseases. Over the same period, the country reported a total of 169,206 cases of Class C infectious diseases incidence of death 27 people. Wherein filariasis morbidity, mortality reports, before the number of reported incidence of the three diseases were other infectious diarrhea, hand-foot-mouth disease and influenza, accounting for 94% of the total reported cases of class C infectious diseases.